So many of the mundane, earthly things we rely on, from GPS to making a credit card transaction, are made possible by satellites orbiting beyond that blue sky, thousands of miles outside of Earth. Space may feel like an untouchable realm, but as the systems we have in place get older, they're becoming even more vulnerable to cybersecurity threats, according to experts. It's something that needs to be addressed, said Jeff Matthews, director of venture strategy and research at the Space Frontier Foundation, a space advocacy nonprofit. "Space allows for some very unique business-use cases and opportunities, and when done right, can really go a long way to protecting communication interests and national infrastructure," Matthews told NBC News. "[However,] we have to be very aware about the information security side up in space and down here." A recent report from Chatham House, an international affairs think tank, said, "the intersection of space security and cybersecurity is not a new problem, but it has remained largely unrecognized as a potentially significant vulnerability." Since its introduction into the mainstream more than three decades ago, GPS has now made its way into almost everything, from our phones to our cars and watches. Americans were given access to global positioning in 1983, after Korean Air Lines Flight 007, traveling to Seoul from New York City, strayed into Soviet airspace and was shot down, killing all 269 people on board. The tragedy prompted President Reagan to speed up his plan for civilian use of GPS. "If the GPS constellation went down, things would stop flying, maps would stop working," Jim Cantrell, one of the founding members of SpaceX and now CEO of Vector Space Systems, told NBC News. 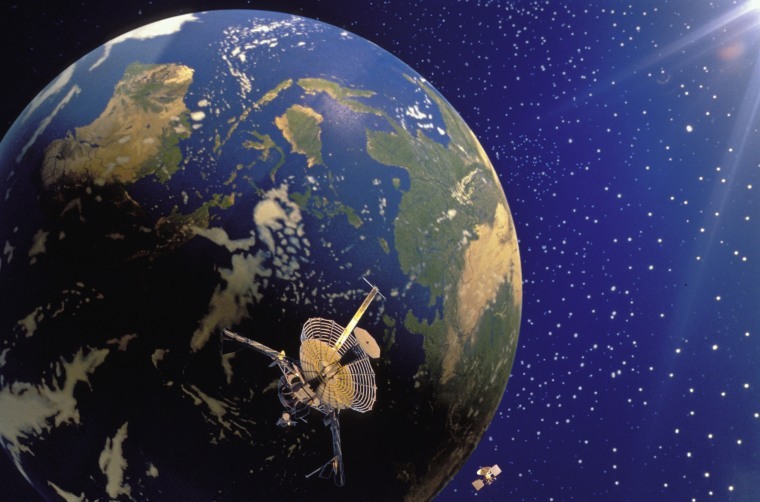 There are a myriad of uses for the satellites in space, from intelligence to communication, navigation and completing capital transactions, such as when you swipe your credit card at the gas pump. "Disruption to that, even on a small scale, can have a wide-reaching impact," said Matthews. David Livingstone, one of the authors of the Chatham House report, told NBC News hackers could pull off a cyberattack by taking remote control of a satellite or by spoofing or jamming its signals. "There is growing vulnerability although there is also growing diversity," Livingstone said. "The cyber threats, whether nation states or organized gangs or terrorists or individual hackers, they are all out there growing even more sophisticated." Two of the cyber attacks Livingstone mentioned are spoofing and jamming. With spoofing, a hacker can send out fake signals to disguise their activity. Jamming is designed to flood a server with so much traffic it causes an interruption. So could that 400-pound hacker sitting on his bed — to paraphrase Donald Trump — have the capability to hack a system in space? "I doubt you would see a lone wolf," Matthews said. "It would have to be a really coordinated attack. I think the low hanging fruit for hackers will be the cube satellites." The US National Oceanographic and Atmospheric Administration took its Satellite Data Information System offline in September 2014 after an apparent hacking incident, which kept weather agencies around the world from receiving necessary forecasting data for 48 hours, according to the report. While there are risks with older infrastructure, Livingstone said sees real cybersecurity threats with "the commoditization of space." Protecting the security of the existing infrastructure is one part of the problem. "It's becoming ubiquitous, and so the question is how do we protect it?" Cantrell asked. China may have one forward-looking solution. The country launched what is said to be world's first quantum communications satellite into orbit in August. While many cybersecurity experts adhere to the belief that everything is hackable, a satellite using quantum communications could be pretty close to tamper-proof, thanks to physics. Quantum entanglement is sort of like sending a message in a soap bubble. If the wrong person pops it, the message will go away, Gregoir Ribordy, co-founder of quantum cryptography firm ID Quantique, told the Wall Street Journal. Quantum satellites are one viable option for the future, according to Matthews. However, in the Chatham House report, Livingstone urged the creation of an "international space and cybersecurity regime" comprised of a "limited number of able states and other critical stakeholders," such as those in the space supply chain and insurance industries. The proposed independent group would be tasked with fostering relationships between key members of the space cyber community, and "provide a vehicle for practical leadership in delivering enhanced security within the whole of the global space sector," the report said. Getting to space historically hasn't been easy, but a number of private companies are now making it more cost effective and accessible for those seeking to bring a part of their business out of this world. And, with new opportunities come new challenges for protecting cyber security in the private sector, such as Cantrell's Vector Space Systems' Galactic Sky program, which helps start-ups leverage the utility of micro satellites through software. "It is going to be different, but one of the attractions of what we are doing and what makes it more secure is we have known and limited access points," he said. "It is a lot harder to get into the system." Matthews, of the Space Frontier Foundation, said he wants to see more of a focus being put on cyber security in space and on the ground — whether it's for our older infrastructure or the newer satellites. "We are on the potential for a revolution to drive space-based security," he said.